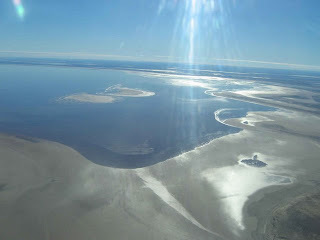 All the rain and flooding in Queensland has resulted in water travelling down to Lake Eyre (pronounced "air") in South Australia. This is on my wishlist of places to visit and see but the cost of a ticket to go for a few days is as much as a trip to Europe so someother time perhaps. 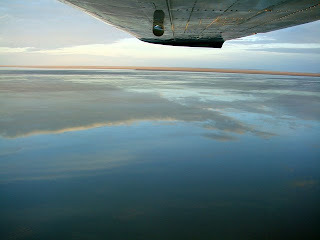 During the rainy season the rivers from the northeast (in outback Queensland) flow towards the lake through the Channel Country. The amount of water from the monsoon determines whether water will reach the lake and if it does, how deep the lake will get. Typically a 1.5 m (5 ft) flood occurs every three years, a 4 m (13 ft) flood every decade, and a fill or near fill four times a century. The flooding at the moment is a once in a decade event.